Though a little pricey in comparison to some, the Brazen 600 offers a winning combination of a rich feature set, clean, simple design, and superior audio quality which bests nearly all of its like-sized competitors. Looking for a portable Bluetooth speaker? Good news: you now have a boatload of choices. Bad news: many of them sound really lame. Though they weren’t the first to come up with one, Jawbone deserves a fist bump for flexing some serious marketing muscle behind the Jambox, thereby popularizing the idea of a palm-sized wireless speaker and setting off a manic manufacturing frenzy of similar products offering a variety of features, design, and sound quality. And the rush isn’t over, either; Kickstarter is hosting fundraising efforts for at least three more models that look promising. As we see it, the challenge is finding that one ideal speaker that offers solid sound quality (that means Bluetooth 3.0 at a minimum) with at least some bass, a built-in rechargeable battery, mobile device charging via USB, lengthy play-time, decent wireless range, and a speakerphone–and it wouldn’t hurt for it to look slick, either. If you collate all those features, your search will eventually end up leading you to the Braven 600. While Braven may not be a household name like Bose or Logitech, the company appears to have the design chops it takes to pull off a decent product. At $150, the Braven 600 is the company’s entry-level speaker. Still, it offers all of the aforementioned features (with one clever addition) and a simple, clean design. But does it sound good enough to meet the average listener’s demands? Read on to get our take. 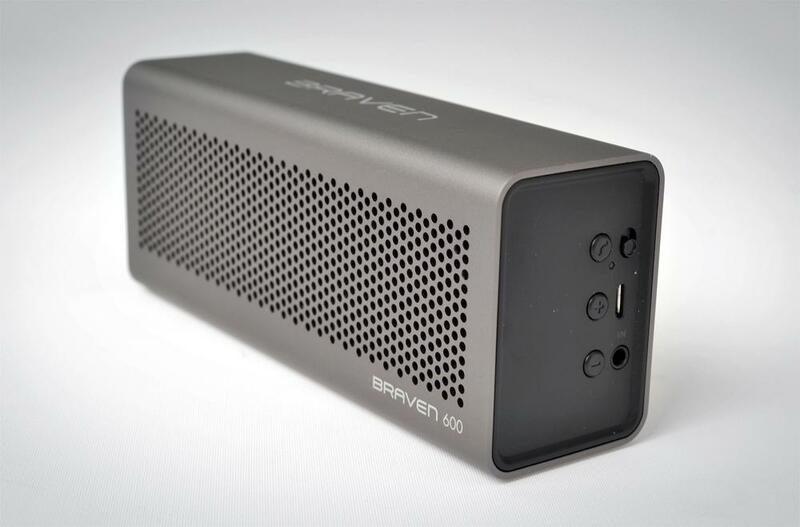 The Braven 600 has a great out-of-box feel to it. The aircraft-grade aluminum exterior gives it a classy tactile experience and the weight (12.6 oz.) is just enough for the speaker to be taken seriously without feeling like it will be burdensome to carry around. Measuring 6.25 x 2.5 x 1.75 (W x H x D- in inches) the Braven 650 is small enough to be toted anywhere and large enough to accommodate enough speakers and electronics to potentially sound good. In the box with the speaker are an array of accessories, including a 40-inch USB to microUSB cable, 24-inch 3.5mm audio cable, USB wall plug and a carrying bag. Though we covered most of the Braven 600’s basic features in our introduction, we should dig a little deeper into how this speaker does what it does. First, the speaker runs on Bluetooth 3.0 profile. The step-up $190 Braven 650 also adds the apt-X compression codec. As we pointed out in our Phiaton PS210 BTNC review, this pairing of technologies significantly improves the wireless audio experience. Gone are our complaints of obviously compressed audio with raspy treble, dodgy bass, and that airy “FM radio” effect we’ve suffered through with so many other products. If a speaker incorporating these technologies sounds poor, it will be due to shabby engineering and not the wireless technology. While Bluetooth 3.0 is already a big step in the right direction, adding apt-X adds that extra little audio-geek touch that some, though few, will appreciate. The Braven 600 sports what appear to be two 1.5-inch speakers (size not disclosed by Braven) on the front of the speaker with two “passive subwoofers” firing from the rear of the speaker. Essentially, those passive drivers on the rear enhance bass by moving sympathetically to the motion of the active speakers on the front. The speakers are driven by a 3 watt-per-channel digital amplifier. Braven claims a wireless operating range of 33 feet (decent) and an average play time of about 20 hours, which will vary based on how loud you play your music. Braven makes no obvious claims as to the output power from its USB port or how long it might take to charge an iPhone or other portable media device but it does say it should play and charge an iPhone for up to 12 hours. 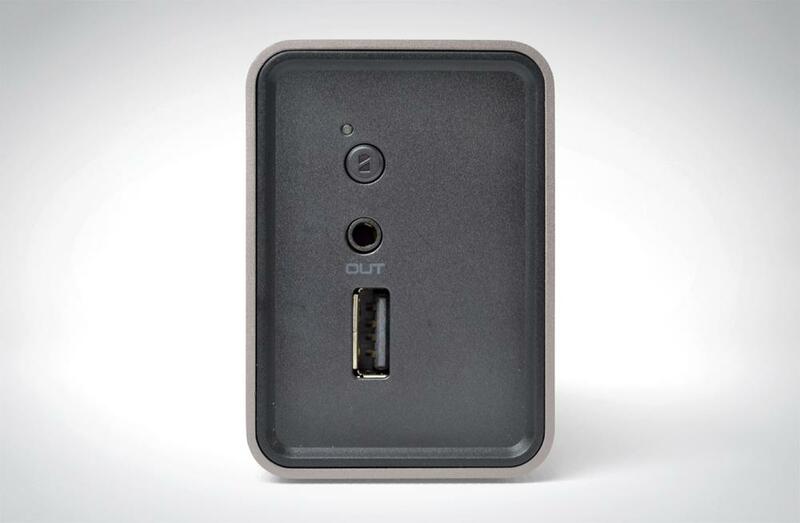 The speaker does include an auxiliary jack so that you can hardwire just about any audio source to it but, more interestingly, it also offers an audio-out jack which allows the user to send the signal to any other powered speaker–including another Braven 650, of course–for more robust sound. This speaker does function as a speakerphone, so there must be a microphone hidden away somewhere, though we can’t see it. On-board control buttons are provided, including one for power, volume up and down, phone answering, and device recharging. Volume control can, of course, always be managed from the connected device as well. Getting the Braven 600 up and running is simple enough that we never had to crack open the manual. After we fully charged the speaker (charging status is indicated by an LED near the power button) we flicked the power switch and were greeted with a sound queue indicating the unit was up-and-running. We pressed and held the phone-answering button until it emitted another sound. Almost immediately, the Braven 600 appeared as an eligible device on our iPhone. We selected it and the two paired instantly–no password needed–with another accompanying sound queue. Only one complaint to mention here: the sound queues provided by the speaker as it powers up and down or is paired with devices is a little loud and the volume for them doesn’t seem to be adjustable. We’d love to see this toned down a bit. We’d place the Braven 600 in the top 10 percent of wireless range performance from a Bluetooth device. This is largely due to the Bluetooth 3.0 profile, but Braven deserves some credit for managing to hide the transceiver within a metal enclosure and still achieve excellent results. Of course, Bluetooth still likes a clear line of sight; so while we were able to stream music without interruption from as far away as 100 feet, that distance was clipped by up to 60 percent if we blocked its “view” of our iPhone. We found the Braven 600 charged our iPhone quickly and was able to manage impressive play time as well. We charged our phone and played music continuously for just under 12 hours. The Braven 600 puts out some impressive sound, considering its size. That is a hard statement to qualify, since there is no intelligible size-to-sound scale that we can point to. But we can say that this speaker puts out some pristine sounding top end, and open, clear upper midrange. It does attempt to put out some midbass and low bass–and you can feel the bass when you hold the speaker in your hand–but the way this speaker was voiced, its bass response only serves to keep the speaker from sounding totally thin. You get no in-room sensation of bass, really–not enough air is being moved for the speaker to have that effect. We should reiterate, however, that we’ve heard very few speakers this small that are able to deliver what we would consider quality sound. Compared to the tiny, handheld speaker “pods” that have become so popular, this speaker is practically a mobile hi-fi unit. To be sure, it is leaps and bounds better than the speakers built into any laptop and, while you may find some similarly-sized speakers that put out more low-end, you aren’t likely to find a cleaner sounding speaker–especially for the price. As ultra-compact portable Bluetooth speakers go, it is hard to beat the Braven 600. Though a little pricey in comparison to some, it offers a winning combination of a rich feature set, clean, simple design, and superior audio quality which bests nearly all of its like-sized competitors. As such, we consider it a recommended product.